The spokesman added that, in August, the new Pantsir-S battery, along with its S-400 regiment at Dmitrov, will be in Ashuluk to perform ‘test’ live firings against low-altitude targets. Novosti has some video of the Pantsir as does a background piece by Arms-Expo.ru. Let’s add things up as best we can. First Deputy Defense Minister Sukhorukov has said the army will get 28 Pantsir-S systems in 2012. The VVS CINC said there would be two more S-400 regiments (for a total of four) before the end of 2011. But, there are, as the VVKO spokesman says, still only two. The CINC also said the next six Pantsir-S systems would be for the Moscow area. The first four went to Novorossiysk. Recall there was some question whether ten delivered in 2010 were for Russian forces or some foreign customer. Have we somehow lost track of six of those ten? Now all these numbers are pretty low when there’s talk that 200, 600, or possibly (incredibly?!) as many as 1,000 Pantsir-S might really be required. 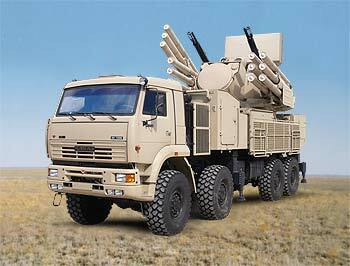 The case of the Pantsir-S is a good example of how, for all the worry about a massive Russian rearmament program, this rearming has been pretty slow thus far. Recent announcements about deliveries of the Pantsir-S1 highlighted the priority still enjoyed by arms exports over domestic procurement of weapons systems for the Russian Armed Forces. On 18 March, the Russian Air Forces took delivery of their first 10 Pantsir-S1 antiaircraft missile-gun systems (ZRPK) from the Tula-based Design Bureau of Instrument-building (KBP). These Pantsir-S1 systems will march on Red Square during the coming 9 May Victory Day parade, before heading to the Elektrostal-based 606th Guards Air Defense Missile Regiment that also has the S-400. Some of the regiment’s Pantsir-S1s will participate in live-fire exercises at Ashuluk in April. The Pantsir-S1 will replace the 1970s-era Tunguska-M1 in Russian air defense units. A short- and medium-range missile-gun system, it provides point defense for civilian or military assets like S-400 SAMs. VVS Deputy CINC for Air Defense, General-Lieutenant Sergey Razygrayev has said three Pantsir-S1 systems will be deployed around each S-400 launcher. The Pantsir-S1 has 2 twin-barrel 30-mm 2A38M antiaircraft guns and 12 57E6-E SAMs. It is reportedly effective against targets with a reflective surface of 2-3 square centimeters and speeds to 1,000 meters per second, at a maximum range of 20 kilometers and altitude of 15 kilometers. The Pantsir-S1 can be mounted on various vehicles and ships, and General-Lieutenant Razygrayev has said it will become a standard air defense system for each of Russia’s armed services and combat arms in the future. When the VVS got its 10 Pantsir-S1 systems, the KBP deputy general director announced that the Air Forces will receive more than 20 units in coming years. 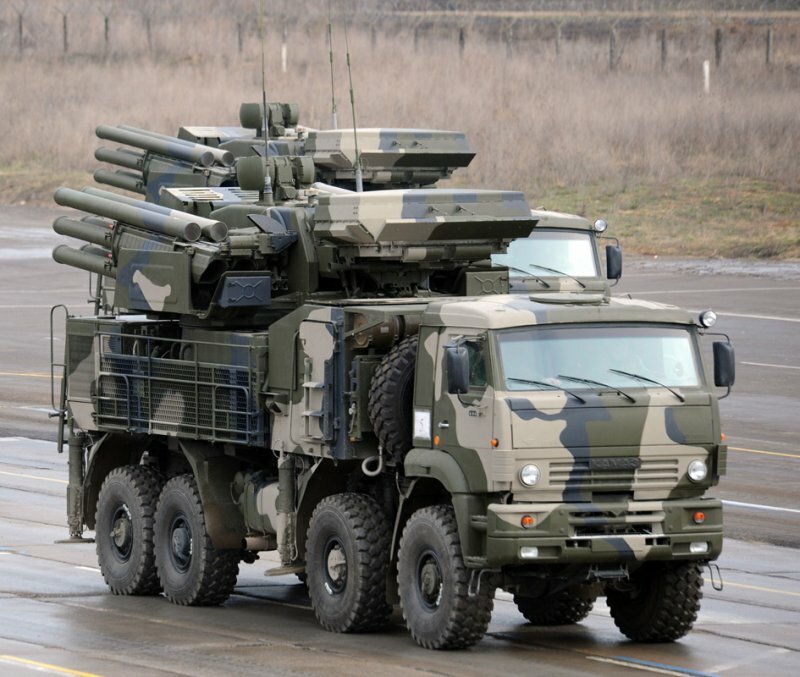 An unnamed source told ITAR-TASS, the VVS would get 25 Pantsir-S1 by 2012. Development of the Pantsir-S1 dates back to the early and mid-1990s. The United Arab Emirates (UAE) signed a contract to buy 50 Pantsir-S1s for $734 million in 2000. Syria also contracted for 36 systems. Ex-Defense Minister, now Deputy PM for the OPK Sergey Ivanov said in early 2008 that 24 systems would go to customers in 2008, from a total order book of 64 for the Pantsir-S1 (of course, 50 + 36 should be 86, not 64). But the Pantsir-S1 didn’t finish development and testing until some time in 2008, and entered production later in 2008 or in 2009. Pantsir-S1 deliveries to the UAE and Syria reportedly began in 2009, and the system is already supposedly operational in the UAE. An OPK source told Interfaks that the first stage of Pantsir-S1 deliveries to these two countries had been successfully completed. This month Moscow announced the sale of 38 Pantsir-S1s to Algeria for $500 million. The systems are supposed to be delivered this year and next. The Russians are reportedly close to a Pantsir-S1 export deal with Libya, and Saudi Arabia, India, and Belarus have been mentioned as other potential buyers of the system. So these are pretty lucrative sales for KBP, roughly $13-15 million per unit. Now back to the Russian Armed Forces which have only 10 newly-received Pantsir-S1 themselves. In late 2007, the commander of Troop Air Defense for the Russian Ground Troops gave his opinion that Pantsir-S1 needed improvements before it could enter his inventory, specifically he wanted its size reduced and better performance against certain types of targets. For its part, the VVS had been looking, and waiting, for Pantsir-S1 since at least 2002. AVN reported in late 2008 that the VVS wants to buy more than 100 of the systems. Even if the Defense Ministry paid $15 million (unlikely), 100 is still a modest buy of $1.5 billion against annual military procurement of about $40 billion these days. But one can guess that the military is haggling with KBP over the price it’ll pay for the Pantsir-S1. And this purchase has to fit with other defense procurement and KBP’s production for its foreign buyers.